Sun still hot and getting hotter - the bimini has been rigged for a bit of shade whilst we're having lunch. 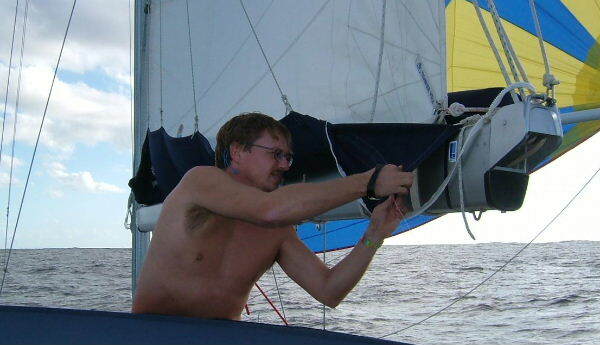 ..and we had some trouble with our spinnaker pole. Firstly the cord for setting the trigger bolt became twisted and refused to set. We brought the pole to the cockpit for a more convenient look but in course of inspection, a crew member who shall be nameless and referred to only by the initial G, managed to lose a critical bit of the pole overboard. The pole is now fixed to the mast by a bit of dynmeema line and looks quite smart and adequately functional. 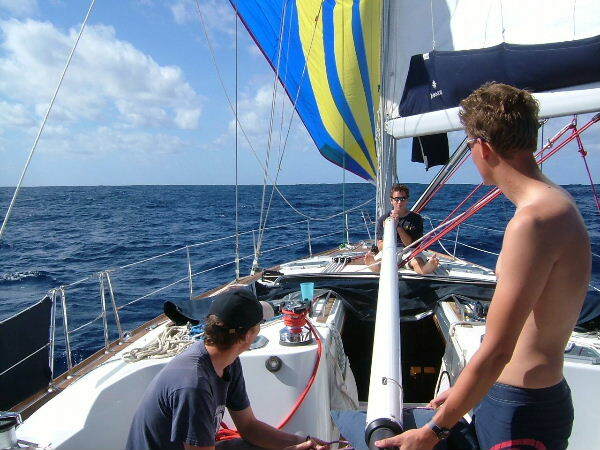 We have seen a couple of yachts, passing astern and I guess headed for the Cape Verdes. Lastly I have to mention for sailors generally, that Movingweather.com for whom we rely on weather forecasts, had their server down this last weekend and, being blissfully unaware that this weekend was the start of the ARC, had no one on duty to fix the problem. Know thy customer ! PS. thanks for emails of encouragement from Greenwich, Bude, Surrey and the Netherlands.